What do you get when you combine a team with a deep roster of executive talent from such companies as Cisco, Apple, and Nokia, and apply that to the world of "Internet of Things"--connecting your entire home to the cloud? You get Greenwave Reality (www.greenwavereality.com), a new startup based in Irvine, which is looking to apply the company's consumer experience to the world of connected devices. We spoke with Greg Memo, the company's CEO, and Nate Williams, the company's CMO, about the company and its new funding. 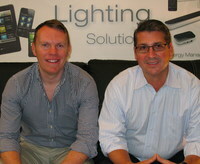 Photo: (Left) Nate Williams, CMO (Right) Greg Memo, CEO. What's your background, and what were you doing before Greenwave? Greg Memo: I was most recently the general manager of the consumer business organization at Cisco, which developed the Linksys Router. My group ran that organization, all of Cisco's connected consumer products, or what is usually termed as devices connected to the Internet. We formed Greenwave, to innovate on the "Internet of Things", before that became a buzzword. You may not have heard of us, because we started in Europe with our products. We had looked at a couple of different markets, and one was in the clean technology space. If you're not familiar with Europe, Europe has a deregulated energy market, which makes it an interesting initial population for the company. We've now branched off to connecting service providers and utilities, providing a home to cloud platform. What is your product all about? Greg Memo: What we have, is a platform which securely connects things to the Internet. At Linksys, we had a problem. We started to see more and more devices connected to the Internet, and most routers can't handle that. You've got low power devices, and things like connected lightbulbs. What our platform does, it is connects them to the cloud and a base service, for energy management, home automation, and media services. Our flagship customers are in utilities, manufacturers, and lighting manufacturers. Nate Williams: I joined from Google three months ago, after my last company, 4Home, was purchased by Motorola. We saw an opportunity in the broad concept of the Internet of Things, which is a variety of things connecting to the Internet. What we;re providing, is a services platform to rapidly build and manage services, taking advantage of Internet connections and devices in a consumer's home. My take on this, is the DNA of this company is people from Cisco, Apple, Nokia, and other companies, and we have the right kind of team to solve this problem. There is an interest from lots of smaller startups on attacking individual applications in connected lighting and home automation, but ultimately, you have to have a quality consumer experience. At Linksys, it was really about making the user experience world class, and removing complexity. The key thing is there's been a polarity between the complexity of all these connected devices, broader standards and protocols, the borderless lifesystem, and the ability to connect any device on any piece of glass. We've already got 150 employees and $31 million in venture capital, so we're pretty established. Explain the problem you are tackling more? Greg Memo: If you look at the problems we saw in our Cisco days, there were two real problems when you start talking about the smart home and the Internet of things. One, is the inability to have usable products. The products being developed have been so hard to use, the average consumer couldn't put it together. That's a real problem. The second thing, is creating a scalable solution which is Internet based. If you look at our solution, it's not only IP type of devices, it's all types of devices, from Wi-Fi devices to things like Z-Wave and other types of devices. The core of what we're getting at, is creating a company that takes advantage of the trend of having everything connected, and having a value-added, cloud-based service that changes people's lives. Companies have been talking about connecting the home for decades. What's key to make this actually happen? Greg Memo: One of the first things, is that you've seen no real, end-to-end solution yet, just lots of point products. There's no ability to have a platform and system that will allow you to connect your devices and just have it work. You shouldn't have to worry about understanding the technology to have it work. You should be able to buy a device and just plug it in. The other thing is usability. The products have simply been unusable. They've been difficult to set up, and it's taken professional installation, which is very complex and costly. That's led to an unclear value proposition for both manufacturers and service providers. Lots of things have been stopping this market. However, what we see is a bunch of trends working in our favor. Those trends are the thing to have true, high speed internet. Not only wireless, but also fixed Internet. Wireless 4G networks are another big trend in the marketplace, and that allows the market to continue to take off. You now have faster, in-home networks where you can actually move around video, when before you couldn't. Literally, the network had been too slow that it couldn't handle the connections. That's been a big limiting factor we saw, which has come and gone. There will be 50 billion Internet devices by 2020, and that's where you're starting to see low cost chips in devices, appliances, watches, you name it. You're going to have a proliferation of devices using cloud-based computing and smart applications, from end-to-end. That will enable really inteligence applications at a site and in the cloud. The last thing, which is a fundamental game changer, are low cost sensors and camera. Not only can you be connected, now you have sensors monitoring anything you want. They can measure your health, the ambient life, your blood pressure, and monitor various aspects of what you're doing. That's a really exciting trend that's occurring by having low cost sensors plugged into an end-to-end architecture, home to cloud, allowing devices to be connected to the intelligence in the cloud. The factors are all coming together, and it's about picking the right partners, and delivering this to the marketplace. Nate Williams: The amount of technology an average household touches has skyrocketed in the last five to ten years. Those are things like the cell phone in your pocket, GPS, your tablet. However, consumers want to feel they are benefiting from all this technology, as opposed to being beholden to this technology. That's up to us as technologists. We need to hide the complexity from the user, and allow themt o be more efficient. One way to think about it, is with the smart home we're now adding more points of presence, nodes and sensors, and the number of those relationships are increasing exponentially. However, you can't assume the end user is going to take the time out of their day to focus on managing the smart home. That's one reason the industry has not been successful, to date. You need to provide efficiency, and make the user experience very easy to understand and navigate. An example of that is a product being offered in the market right now, which is a connected lighting solution, with lighbulbs controlled by cell phone and tablet. In that user interface, it's very easy to set automation that allows lights to turn on at sunset, and turn off at sunrise, and you don't have to think about it again as that changes throughout the year. That's one place where a really focused experience has made this much better. There's a series of these small improvements which will make the consumer excited about what this kind of technology can bring to them, and doesn't make them become CTO of their own home. Greg Memo: After announcing our funding round, where we closed $19M, the next big objective is that we have flagship customers in different regions, where we're going to be aggressively rolling out our solution. WE're going to give people the ability to connect in the home, bringing applications like lighting, home monitoring, and the ability to manage your network. Our big value add, is not only providing connectivity, but advanced management tools, such as self healing applications for service providers. That's what we're focused on now, using that capital to grow out the company and accelerate our rollout with customers. Nate Williams: We're very large, with 150 employees, and we have the types of executives that you need to be credible. We've got the pedigree to be able to do this, with our previous lives at Motorola, Apple, and Cisco. That's a dangerous combination. We know how to execute at startup speed, where it's all about execution, but we also have the previous experience of running products which have shipped 100's of millions of units. We know how to fit customer needs, but we also understand the channel. We're avoiding the difficulty lots of smaller startups find, in determining their market fit, and where they don't know their customer and channel. Greg Memo: Where we're different, and why we're winning and getting funding, is we have the consumer product expertise and networking expertise, which is very rare in this space. That really does uniquely differentiate us. We know how to build an end-to-end platform, from connecting devices to cloud based services.